Over the past few months, members of Operation Tackle That Bead Stash have been working on projects from The Art & Elegance of Beadweaving by Carol Wilcox Wells. 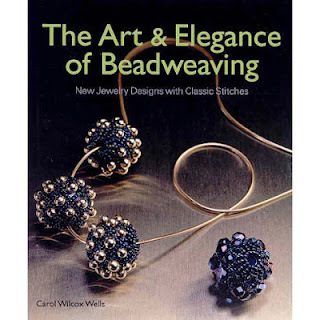 The book seems to be well loved - and there are plenty of beaders in the OTTBS Facebook Group who recommend the book highly - so I was thrilled when I found that a copy was available through my local library. However, flicking through for the first time, I realised that the vast majority of the projects were beaded ropes, choker style necklaces or heavily fringed. So, I have to admit that this isn't a book that excited me as a beader, they really aren't my usual style. I hoped that starting on a simple project would help to change my opinion, but when I started working on the Lace Net Beads I found it difficult to follow the written instructions and, as halfway through the instructions, beads previously denoted by letters were suddenly being referred to by numbers, I became increasingly frustrated beading what should have been a simple, embellished netting pattern. Considering that netting is one of my favourite bead stitches, I was a little disappointed! Maybe that first flick through coloured my perceptions, because every time I sat down to work on something from the book I just felt entirely underwhelmed; maybe the dull, gloomy weather influenced my mood; maybe I should have tried a little bit harder; or maybe this just wasn't the right beading book for me! As much as I would love to have a finished, or even partially completed project, to show you, I didn't pick up The Art & Elegance of Beadweaving again - I don't like the idea of trying to force something that should be fun and creative! So, the book went straight back to the library where it was, I hope, picked up by one of the many beaders who adore the projects within it's pages and love it dearly! If you fancy finding out what everyone else thought of the book - I have a feeling I'll be in the minority - head over to Operation Tackle That Bead Stash where you'll find links to other reveals and reviews. I thought it was just me. I always hear such love for this book, yet I started two projects from it and found the instructions for both hard to follow. Maybe she just has a distinctive style that appeals more to some people than others, but I agree with your review. Thanks!